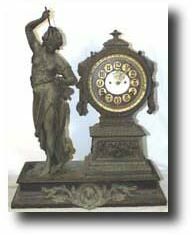 Ansonia " FISHER" , circa 1880\'s Large figural clock at 19" to top of her hand. Case: Cast figural with some of the original finish remaining. Works: Ansonia 8 day time and strike with open escapement. Reference: Ansonia Clocks by Tran Duy Ly Condition: Case: In need of restoration, top or spear missing. Works: Needs cleaning, no pendulum.